Microhardness has been evaluated as a function of a zone selected in the cross section for samples made of EDT-69N, UP-2227N, and VST-1210 binders that have been cured at various temperatures and times. The microhardness of a sample is shown to vary from its surface toward the core in accordance with a parabolic law with a maximum in the core. Furthermore, the higher the temperature and the longer the time of curing, the greater the microhardness of a binder. 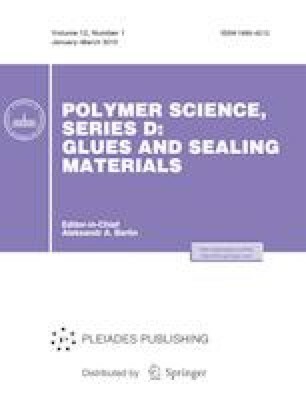 This work was supported within the framework of Complex Scientific Project 13.1, “Binders for Polymer and Composite Materials of Structural and Special Purpose” (“Strategic Directions in the Development of Materials and Their Recycling Technologies for the Period to 2030” ).